Once, a long long time ago, there was a man named Cecrops. Cecrops, whose name means "face with a snake," was half-man and half-snake. He was also the founder and first king of Athens. Athens started looking pretty good, and Athena and Poseidon both wanted to be the patron of it. They were on the verge of attacking each other, when the wise Athena came up with an idea about who could win the city. It was decided that whoever gave the city the best gift would get it as her/his own. Cecrops was the agreed upon arbitrator. Leading a huge crowd, the ascended to the Acropolis to give their gifts. Poseidon was first, and he lifted his trident and struck the earth with it. A spring shot forth and began pouring out water. The people sighed in wonder, but when they tasted it, they were not so impressed for the spring was as salty as the sea Poseidon ruled. Athena, on the other hand, merely knelt and buried something in the ground. It was an olive tree. Simple, yes, but the olive tree was also a rich gift. It gave the Athenians the olives (food), oil, and wood. Cecrops deemed Athena's the better gift. 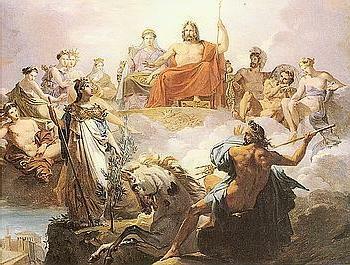 As the winner, Athena name the city after herself (Athens, of course). At the Acropolis, the citadel was named Cecropia in honor of Cecrops.